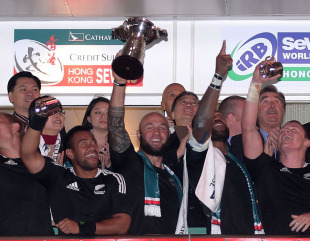 New Zealand claimed the Hong Kong Sevens title and opened up a five point lead in the IRB World Sevens Series after beating closest rivals England 29-12 at the Hong Kong Stadium on Sunday. Frank Halai, who was hampered by an ankle injury throughout the tournament, ignored the pain to score two tries as New Zealand ran in five tries to three to claim the 30 points on offer for winning the Hong Kong title. They now have 110 points in the world series, five points ahead of England. Captain DJ Forbes sat out the match with a hamstring injury, and it was his replacement in the starting lineup Solomon King who opened the scoring after quick thinking from Tim Mikkelson put him into space out wide. Mikkelson was back in the action soon after to make a try-saving tackle on Greg Barden to hold him up over the line but from the ensuing scrum Mat Turner evaded Bryce Heem to score in the corner. With the greasy surface posing problems with players' footing, New Zealand playmaker Tomasi Cama broke out from deep in their own territory to release Halai, who started the final in place of Declan O'Donnell, to cross under the posts and give Gordon Tietjens' side a 12-5 lead at the break. After England's Dan Norton threatened to score shortly after the restart, Halai struck back to run almost the length of the field to open up a 12-point lead. More Cama brilliance exposed England on the blindside and the Manawatu representative scored to further extend the lead before Barden narrowed the deficit. But any thoughts of a stirring comeback were scotched by the impressive Mikkelson who burst through to ensure New Zealand would claim the title. A late Norton try was mere consolation for England who will look to turn the tables on New Zealand in Adelaide this weekend. England had reached the final after beating Samoa 19-14 in the semi final and ending Russia's first foray into the last eight of the cup competition with a tight 10-7 win. England had been trailing 14-12 in a physical contest against Samoa before Chris Cracknell scored the decisive try with less than a minute remaining. New Zealand, who had thrashed Portugal 33-5 in their quarter final, beat Fiji by 19-14 in the other semi as they withstood a second-half onslaught from the Pacific Islanders having led 19-0 thanks to tries from Lote Raikabula and two from Mikkelson. In the Plate final South Africa beat Australia 26-19 and Canada swept past Japan 33-12 to claim the Bowl competition while Kenya took the Shield.